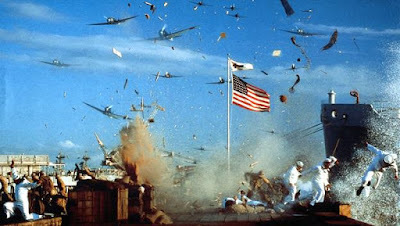 So spoke FDR on December 8th re: the attack by the Japanese on our naval base in Pearl Harbor, Hawaii. "Yesterday, December 7, 1941—a date which will live in infamy—the United States of America was suddenly and deliberately attacked by naval and air forces of the Empire of Japan." As a kid growing up in the 60's - being raised by the WWII generation - I did not understand the animus, and at times, even white hot hatred - I witnessed directed toward the Japanese. I do now. History matters. As War Daddy opined in the movie "Fury" - Ideals are peaceful. History is violent. And none were more violent and less merciful than the Japanese. Their war crimes were every bit as horrific as those perpetrated by the Nazis in Europe; they just received less press. Part of that has to do with us annihilating a couple of their cities - and a few hundred thousand of their citizens - with the atomic bomb. No doubt that led to perhaps the biggest moral conflict of the Greatest Generation: Yes, the Japanese were inhuman, merciless bastards in war...but did they deserve that? "The war situation has developed not necessarily to Japan's advantage." Today we mourn all that was lost on that dreadful day and the path that was set for the future. As Einstein famously uttered, I do not know what what weapons will be used to fight WWIII, but I know WWIV will be fought with sticks and stones.